I am pleased to announced today that the book, Rush On, Boys: Hamilton at War (print version) is now shipping globally. The official release date is tomorrow but you can purchase it now. The Kindle version will be released next week. And the audiobook version is now being recorded in Scotland by veteran BBC narrator, James Gillies. Please click on the advance audio excerpt below. Gillies grew up in Scotland where he still resides and he is recording the narration only six (6) miles from the county line of Ayrshire which is ancestral home of Alexander Hamilton. Gillies knows the Hamilton story well and he related to me a tale which may or may not be true but both he and I agree it is fascinating. Gillies, "As a child I was taught that Hamilton's ancestors came from Ayrshire, a county whose border is only some six miles from here. In Ayrshire is a place called Dollar. It is a compact town these days, but once upon a time it was primarily known as the site of the Scots' Royal Mint, and the coins made there were known, not surprisingly, as 'dollars'. In the fullness of time, the dollar coin was replaced by a currency known as the 'pound Scots' and new dollars were no longer minted. However, as they were made of solid silver, they continued in circulation, far beyond our shores, disseminated by sailors and fishermen as they moved from port to port. Eventually many of them were to be found in the hands of the privateers and other ne-er do wells who made their living around the West Indies. As a result, goes the story, Hamilton would have been utterly familiar with the dollar, both from shared family memories of Scotland and from the turbulent trade which moved through the Caribbean as he was growing up. The story goes that when Hamilton and the others were discussing the establishment of a new American currency, there were strongly argued objections to creating an American Pound due to its unwelcome associations with the former colonial power. Hamilton, it is said, reached back into his memory and suggested the name of the coin associated with his family's former home, and thus the Dollar was reborn. As I said, this latter part of the story might be apocryphal, but I find it quite interesting." And I agree. Look forward to the audio book release during the first part of March with James Gillie's stirring narration. He truly brings Hamilton's war time story in Rush On, Boys to life. 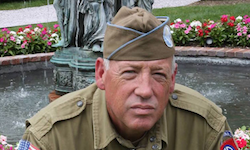 Be sure to catch or DVR, Never Surrender The Wereth Eleven, tonight on Military Channel at 10P Eastern / 9P Central. Rob Child and Assoc., is pleased to announced today that Videosmith, Inc., the leading camera rental house in Philadelphia has been named "Exclusive Camera and Equipment Supplier" to the Gettysburg 150th Commemorative film, Final Measure of Devotion. Robert Child, director of the film commented, "I have worked with Videosmith many times in the past ten years and their service is second to none. They really go out of their way to make sure you have the right gear and tech support on hand for the most demanding shoots." Chris Cerasoli, General Manager of Videosmith commented, "We are honored to be part of such an historic event and are excitedly looking forward to July." The production will feature a true cinematic look and a combination of cameras have been chosen to capture the action. The film will utilize the breathtaking new Canon C300 large sensor cinematic camera for close of shots. "Embedded cameramen, those actually in Civil War uniforms within the various battles will be shooting with the C300," Child reported. Rounding out the camera complement will be the new Panasonic HPX 250 which records to P2 cards and shoots in true 4:2:2 color space. It's codec equals that of the Varicam. Videosmith will also be providing tech support and edit personnel to turn around video dailies on site. 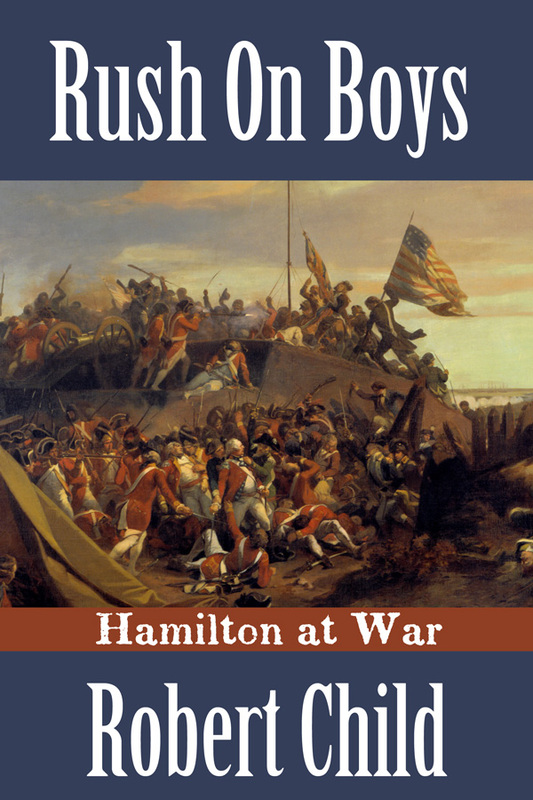 The paperback version of my forthcoming historical fiction novel, Rush, On Boys: Hamilton at War is now available for pre-order on Amazon.com (here) The book released on Feb 28, 2013 and also will be on Kindle. 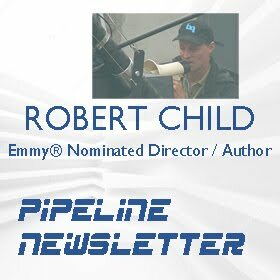 The Russian van Gogh is the latest from Emmy® Award nominated writer / director Robert Child. Karpov’s plans to extort the Putin administration are met with an iron fist and he turns to the world stage releasing a shocking tape to the BBC declaring he will burn the van Gogh and other paintings if his ransom is not met. 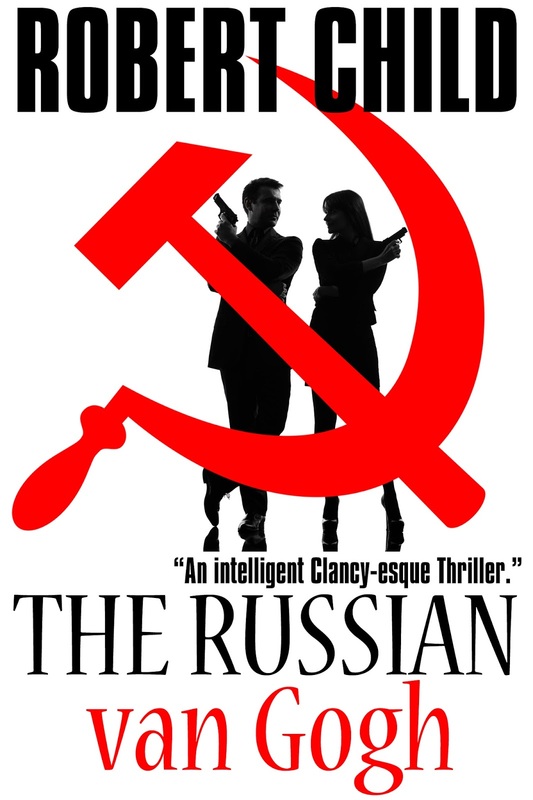 The Russian van Gogh is available in both print and ebook formats. 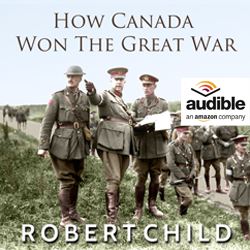 Child’s other books include Blood Betrayal (ISBN: 9781476429366), How Canada Won The Great War (ISBN: 9781476398891) and many others. 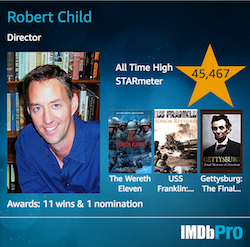 Robert Child is the winner of more than 25 writing and directing awards and is one of only a handful of directors whose work has screened in the Congress of the United States. Silent Wings debuted on Capitol Hill on the day of its release in 2007 and became the catalyst for New York Congresswoman, Carolyn McCarthy's, House sponsored, Joint Resolution honoring America's WWII glider pilots. He has worked with several Hollywood "name" collaborators. Hal Holbrook narrated Silent Wings, which featured Walter Cronkite and Andy Rooney. 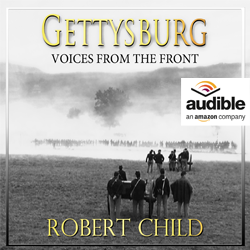 Civil War theatrical director, Ronald F. Maxwell, (Gettysburg, Gods & Generals) narrated his Lincoln and Lee at Antietam: The Cost of Freedom. Corey Reynolds (The Terminal, The Closer) narrated The Wereth Eleven and actor Dale Dye, Stephen Spielberg's Senior Military Advisor on Saving Private Ryan and Band of Brothers narrated the USS Franklin: Honor Restored, film in 2011. 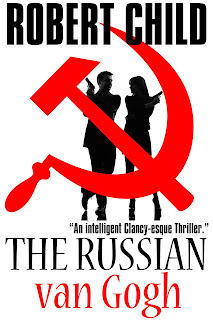 I am excited to announce the release tomorrow on Amazon Kindle of the new international thriller, The Russian van Gogh. 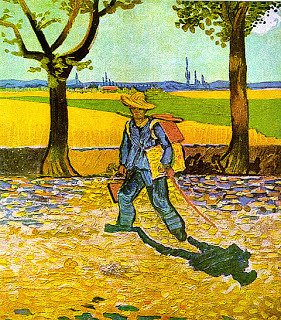 I began writing the book last June with the question which became the premise - what if the masterpiece considered the most valuable painting lost during WWII, The Painter on the Road to Tarascon by Vincent van Gogh actually wasn't lost at all. What if instead the Russians and the Red Army Trophy Brigade pulled off the most daring art heist in history and seized the priceless van Gogh just before the German museum where it resided was destroyed. Rumors to this effect circulate today and the fate of the painting remains a mystery. The Russian van Gogh takes this premise and runs with it. The secret Russian government warehouse where the van Gogh now resides is breached by a Chechen terrorist and criminal mastermind who has a score to settle with Vladimir Putin in a grudge that goes back to the Russian - Afghan War. With the terrorist's demand of ransom the van Gogh Museum in Amsterdam enlists the help of the British Intelligence Service, MI6 and the Monuments Men Foundation - experts in stolen WWII cultural artifact recovery to secure the painting. The Monuments Men turn to the world's leading expert on the paintings of van Gogh, Harvard-based forensic art detective, Dr. Riley Spenser. Spenser an attractive female professor on the verge of receiving tenure at the hallowed institution must decide whether to give up everything she's worked for to help find what has now become the world's most expensive van Gogh valued at more than $300 Million dollars.